Alert destinations define the format and recipients for an alert. There is no limit to the number of destinations that you can create and no limit to the number of alerts that can share a common destination. The same alert destinations can be used for Performance (Browser Agent) tests and Availability tests. View a list of all alert destinations for your account in the Alert Destinations tab of the Alerts page. You don&apos;t need to create an alert destination to push an alert notification to your mobile device. When creating the alert, add a notification and select mobile application (push notification) from the list of destinations. 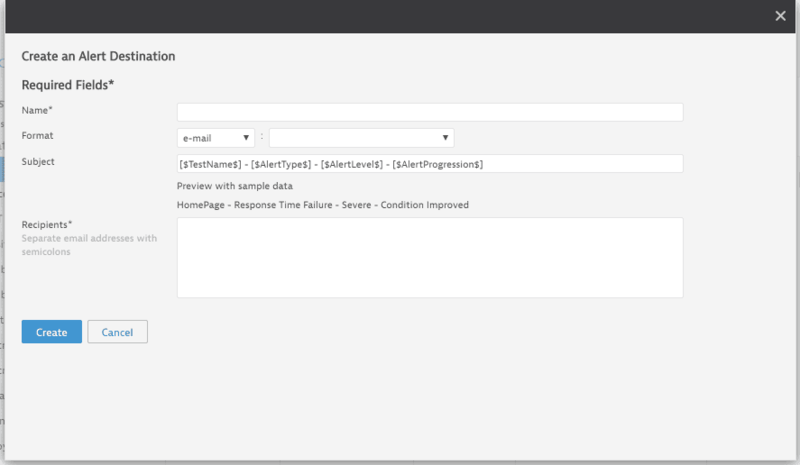 Selecting this option makes the alerts available to your mobile device and to the Dynatrace Synthetic Mobile app, depending on your device&apos;s notification settings. On the Alerts page, click Create an alert destination in the Alert Destinations tab. To display the Alerts page, select > Alerts. When editing a test, click Create Alert Destination in the Notifications section of the Alerts Settings tab. Select the settings, described below. Review the alert destination to make sure there are no extra spaces, carriage returns, or special characters. Invalid characters or formatting may prevent the alerts from being sent to the destination. To integrate alerts into a Network Management System (NMS), we recommend that you post XML alerts to a specified URL as described below, and then create a receiver that listens for these incoming alerts. In the Alert Destinations tab of the Alerts page, click Action > Edit for the alert destination you wish to edit. The Edit an Alert Destination page appears. Modify the settings, described below. In the Alert Destinations tab of the Alerts page, click Action > Copy for the alert destination you wish to copy. The Copy an Alert Destination page appears. Modify the settings (optional), described below. Enter a new name (or keep the default name of "Copy of <AlertDestinationName>"). You can only delete alert destinations that are not used by any test. In the Alert Destinations tab of the Alerts page, click Action > Delete for the alert destination you want to delete. When you are prompted to confirm the deletion, click Delete. Email alert notifications are sent from prodrelay.dynatrace.com, IP address 69.84.209.241. Notifications to other alert destinations are sent from IP address 69.84.208.126. Specify a unique name that identifies the purpose of this destination. Select e-mail from from the first Format list. From the second list, select the format type for the email content, depending on the formats your email system supports. For example, the content can be plain text, standard HTML, or raw XML. Select Plain Text Pager to send alerts as text messages to a mobile phone, using the carrier&apos;s email-to-text service. Enter a subject line for this destination. You can use plain text, or use the variables defined below to provide alert-specific information in the subject line. These variables are converted to real values at delivery time. The preview strings show examples of how the values are displayed in the subject line. [$AccountName$] – Your account name. [$TestName$] – Test name that triggered the alert. [$PageInfo$] – For step-level alerts, the step number and name of the page that triggered the alert. This variable only has a value for step-level alerts; it&apos;s never populated for test-level alerts. [$SiteThresholdNum$] – Defined minimum number of sites that must be in an error status to generate an alert. [$SiteThresholdPerc$] – Minimum percent of sites that must be in an error status to generate an alert. [$SitesInTotal$] – Total number of sites evaluated for the alert. [$SitesInAlert$] – Number or percent of sites in violation of the alert criteria. [$AlertProgression$] – Current status of an alert, such as Initial, Reminder, All Sites, Condition Improved, or Sample. [$AlertType$] – Type of alert being triggered. Values for the Browser Agent are Response Time Failure, Transaction Failure, Object Failure, and Byte Limit Failure. [$AlertLevel$] – Current status of an alert. Possible values are Good, Failed, Warning, or Severe. [$AlertTimeStamp$] – Time the alert was correlated. There is a 250-character limit for the Recipients field. If you have a large number of email recipients defined in your alert destination, and are not receiving emails but you see in the Alert Log that alerts are being reported as sent, consider either decreasing the number of recipient email addresses or creating a distribution list that includes all necessary recipients. Best practice is to create a distribution list in your email system and use that single address as the destination. Any changes of recipients can be managed in that distribution list. Alert destination types URL, Slack, ServiceNow, and VictorOps are currently supported only for Backbone tests. The destination URL must be a public URL (not, for example, your intranet). The URL must be a domain URL (e.g. http://alerts.dynatrace.com); don&apos;t use an IP address. The URL must include the port, which must be be port 80 or 443. Other ports are blocked. The POST data sent by the Synthetic Classic service is formatted as standard POST requests. If your server is defined to only accept standard POST requests, use a script to extract the data; otherwise you may only see POST requests but no POST data. Select URL from the first Format list. From the second list, select the appropriate format to post the notification to the web page. Enter the URL for the web page where you want to post the alert. Select ServiceNow from the Format list. 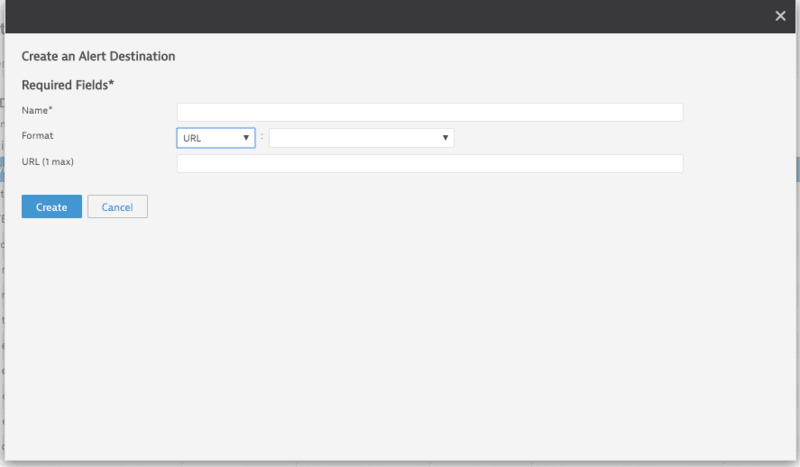 Provide the username for the ServiceNow user who should receive the alert notifications. If multiple users should receive the notifications, you&apos;ll need to create a separate destination for each user. 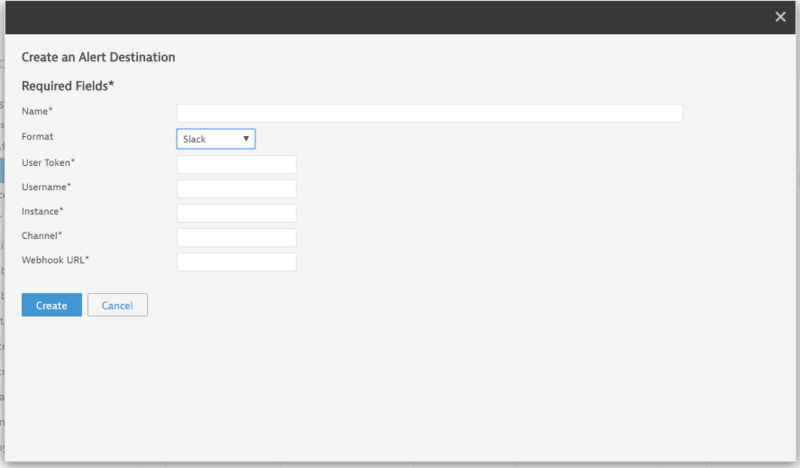 Provide the password for the ServiceNow username. The saved password will be encrypted/encoded. 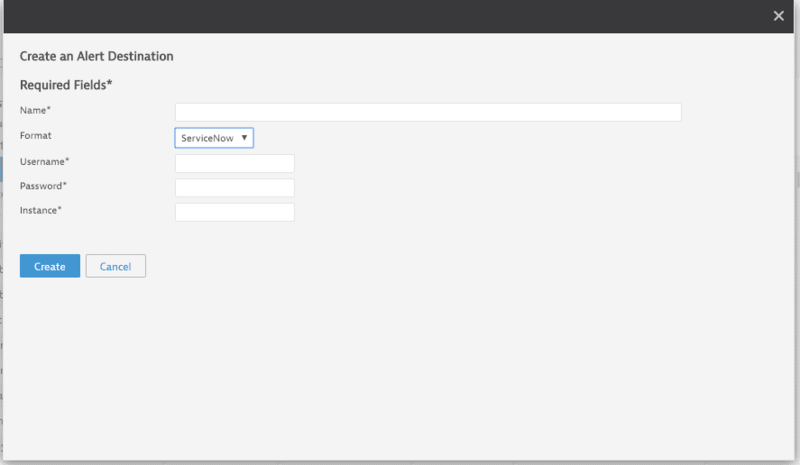 Provide the instance name for the ServiceNow instance. Don&apos;t include servicenow.com: for example, if the ServiceNow instance is dev25167.servicenow.com, this field should only contain dev25167. Select Slack from the Format list. Use this field to create a username that identifies the Slack message as coming from Synthetic Classic. The username doesn&apos;t need to be defined in Slack. Enter the URL of the Slack team: <teamname>.slack.com. Specify the Slack channel where the notifications should be posted. Do not include the # symbol at the beginning of the channel name. Specify the Slack webhook to which the notifications should be sent. In the Slack app, select Manage, then select Custom Integrations. Select Incoming Webhooks and configure a new webhook for the Synthetic Classic notifications. Return to the Portal and enter the URL for this new webhook in the Webhook URL field for the alert destination. Select VictorOps from the Format list. 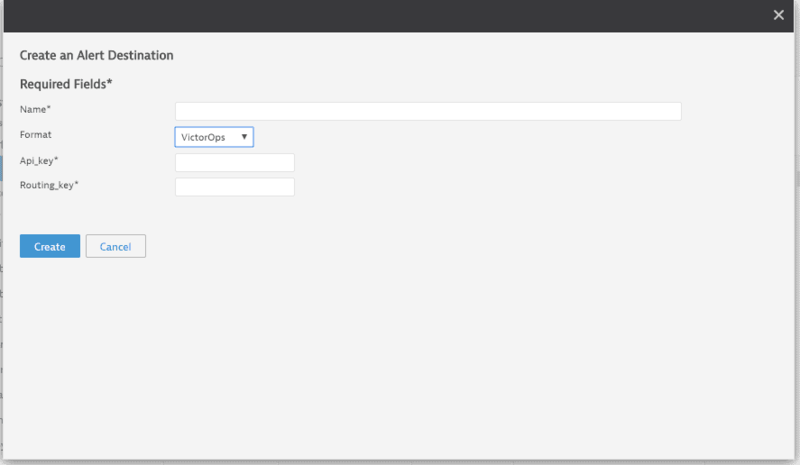 Use the Integrations feature in VictorOps to generate an API key, then enter that key in this field. For more information about the API key, refer to the VictorOps documentation. Specify the routing key for the VictorOps team that should receive the notifications. For more information about routing keys, refer to the VictorOps documentation.